The moment an airline gave a breastfeeding mum of triplets exactly what she needed. Sadly, it’s not often that airline cabin crew are congratulated for their approach to women who are breastfeeding or pumping milk. But a Facebook post from female passenger Jade Mde to Delta Airlines has gone viral for all the right reasons. On a flight from Atlanta to Dallas-Love Field, Mde was catered to by two flight attendants, Kaitlin and Loretta, who made the mother of triplets as comfortable as possible as she needed to pump milk. But the airlines open attitude and willingness to offer assistance didn’t stop there. Mde was offered the same level of service on her flight home. 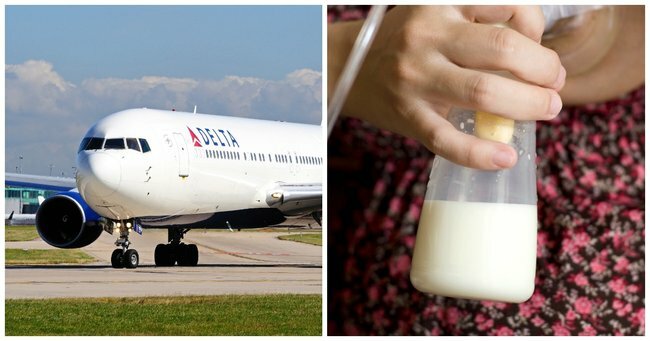 Mde noted that as a mum feeding three babies, it is integral that she “not miss a breast-pumping session, especially when traveling.” And thanks to Delta’s staff, she didn’t have to. Yet it’s not the first time the airline has been in the news for their attitudes towards mothers with newborns. CNN reports Delta were forced to issue an apology to one passenger in 2015, after forcing her to check in her breast pump. @DeltaAssist then several passengers after me brought on their bags. Meanwhile I cannot access my pump. In 2014, another mother enquiring about the airlines policy was mistakenly told that she would be required to cover herself while breastfeeding her son. Thankfully, Delta appear to have lifted their game for 2016. “I am incredibly grateful for the lengths these individuals took to make my role as momma much easier and impressed by the advocacy this company has provided for breast-feeding and pumping,” Mde posted. Let’s hope it continues. Airlines of the world, take note.